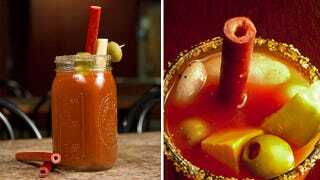 They're designed to be used with more savory drinks like a bloody mary, but there's no way these edible beef straws—made from hollowed out Slim Jims—won't improve the flavor of any beverage. A pack of 30 will cost you $34, so Benny's Bloody Mary Beef Straws certainly aren't a cheaper alternative to regular plastic drinking straws. But like licorice, they're completely edible. And unlike licorice, they're made from more delicious seasoned beef.